Major General Edson was born in Rutland, Vermont on April 25, 1897. In 1915, he attended the University of Vermont. Near the end of his sophomore year, Major General Edson joined the Marine Corps Reserve to fight in World War I. On October 9, 1917, he was commissioned a Second Lieutenant. For the remainder of World War I, Major General Edson served in the Eleventh Marines in France and the Fifteenth Separate Battalion during the occupation of Germany. In 1919, Edson returned to Vermont, and in 1920, Edson married Ethe Winifred Robbins. Shortly after, he became a member of the Marine Corps Aviation. General Edson was then ordered to sea duty where he was ordered to Nicaragua with sixty men. Nicaragua was unbearably hot and humid, and it was extremly wearing on the men. Between 1929 and 1931, Major General Edson served as a tactics instructor for the Second Lieutenants in the Basic School in Philadelphia. When Major General Edson joined the Marines, he became involved with competitive rife and pistol marksmanship. In 1921 he became a member of the Marine Corps Rifle Team. Because of his enormous talent, he was given the distinctive position of Captain of the Marine Corps Rife and Pistol Team in both 1935 and 1936. 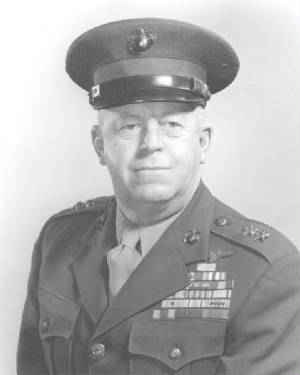 After the United States entry into World War II, Major General Edson was assigned to Quantico as the Commanding Officer of the first Battalion, Fifth Marines. These Raiders were known as the First Raider Battalion later to be called “Edson’s Raiders”. It was during this time when Major General Edson became known as “Red Mike”, his code name during the war. His men fought hard battles against Japan with many casualties. The now famous “Red Mike” was awarded the Medal of Honor for “extraordinary heroism above and beyond the call of duty”. Shortly after he was promoted to full Colonel where he left the Raiders to command the fifth Marines. Major General Edson retired from the army in 1947. He went back to his home state of Vermont where he became the Director of the Vermont State Police. He also became the Executive Officer of the National Rifle Association. On August 14, 1955, Major General Edson committed suicide. He died at 58 years old from carbon monoxide poisoning. Those who knew Major General Edson remember him for his professionalism, personal leadership when in battle, and his love and understanding of the “soul” of a Marine. He was a strict leader, and his thoughts were always for the welfare of his men first. He always expected is men to be on good behavior. Major General Edson’s only rules were fighting hearts and rigid discipline. Most of all, Major General Edson is known for his loyalty and love for his country. Major General Edson was honored in many ways. Part of Camp Pendleton’s Stuart Mesa area was named Edson Range in his honor (1964). A destroyer ship in the US Navy was also named after him (USS Edson). "COMMANDING OFFICERS, U.S. MARINE RAIDERS." World War II US Marine Raiders. Dodge, Russ. "Merrit Austin Edson." 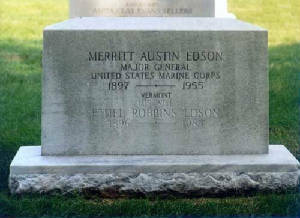 "MERRITT A. EDSON Colonel United States Marine Corps ." 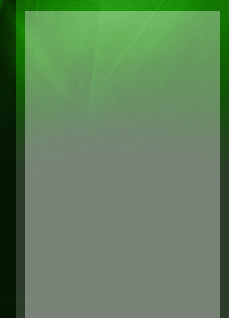 <http://www.marinemedals.com/edsonmike.htm>. "Merritt Austin Edson and his Raiders." Patterson, Michael Robert. "Merritt Austin Edson Major General, United States Marine Corps."